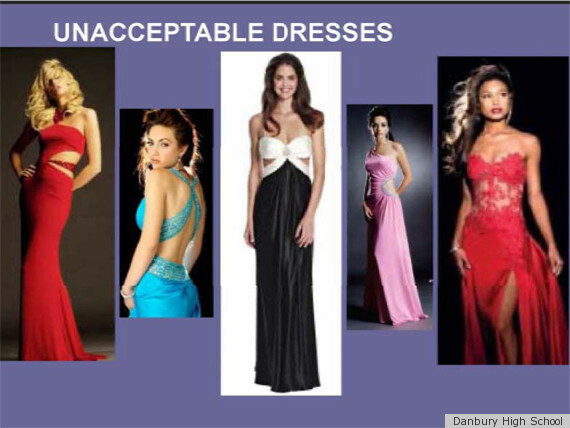 Lest high school girls wear something regrettable on prom night (because that's never happened before), school administrations are cracking down on the dress code for those bright, shiny gowns. The Wall Street Journal finds that teenage girls are picking increasingly risque prom dresses, featuring "low-slung backs, thigh-high slits and midriff-bearing cutouts." In response, some school principals are enforcing stricter guidelines and even creating elaborate PowerPoint slideshows showing photos of "acceptable" and "unacceptable" dresses. So what's not allowed? As it turns out, all sorts of red carpet trends, like side cutouts (so certainly no sideboob), plunging backless-ness (no Hilary Swank dresses), overly exposed midriffs (use Gwyneth Paltrow's Pucci as a guide) and -- this is the biggie -- no sheer. Part of the issue, points out the Journal, is that requirements like those encompass what plenty of celebs wear. Jennifer Lopez, "Dancing With The Stars" costumes and the wardrobes of "The Real Housewives" are apparently serving as fashion inspiration for excited young teens. Which makes us wonder if the administrators making the rules are concerned with modesty or simply good fashion sense. In the case of banning sideboob, sheer hems and excessively exposed midriffs, they may be addressing both and doing an entire generation of girls a favor. Read more at WSJ.com and take a look at several "unacceptable" dresses (pulled straight from real high schools' prom handbooks) and tell us: do you think these frocks belong at the prom?